Waitress steals credit card numbers… tip of the iceberg? By now you’ve probably heard about the Hamburger Hamlet waitress who stole patron’s credit card numbers using a “wedge” or “skimmer” device, and then selling the info to a dude at $10 a number as part of an idenitity theft scam. According to whats been reported, the woman only stole 40 credit card numbers. On the bright side, she was never paid the full $400 she was allegedly owed. On the dark side, I don’t believe she was only able to steal 40 numbers over her six week’s employment… unless the Hamlet really is that slow all the time. Its more likely that even more customers never noticed or successfully complained about fraudulent charges, or that additional numbers had yet been used by the thieves. And, of course, worse of all is that this is one woman who was caught… credit card “skimming” is apparently a growing criminal tactic, so its a given that there are scores of similar criminals at work in the Los Angeles area, a city overflowing with underpaid, out of work actors trying to make rent, afford car payments, and pay back student loans who probably hate you anyway for leaving your tip on your credit card instead of paying cash… but I digress. Anyway, the Consumerist has a couple videos of this scam in action. 1. Never let a waiter or waitress walk out of sight with your credit card. 3. And if you must use your credit card, keep an eye on your credit card statement, and do a bi-annual check of your credit report. Risking jailtime for $200-400? What a loser. If you are going to steal go for the big time, knock off a Brinks truck or something. If you get caught it’s probably less of a jail term than identity theft. And, if you get away with it you’ve got countless $$$$$. 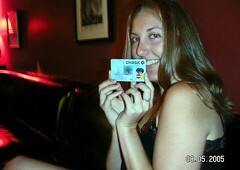 Wow I can’t believe that waitress posed for a photo with one of the stolen credit cards! Talk about brazen! I had this happen in Vegas at a hotel shop. They swipe it like normal and then hand it right back. No good. But, also, the advice to “Never let a waiter or waitress walk out of sight with your credit card” is pretty silly. How often is the cash register at a restaurant within the customer’s gaze? lol are you serious cory? ’cause i can’t detect any sarcasm in your post? Whew….thank gawd it wasn’t the Sherman Oaks location. I eat there about twice a month. Wow, identity theft waitresses are hot! She can scan my card anytime.